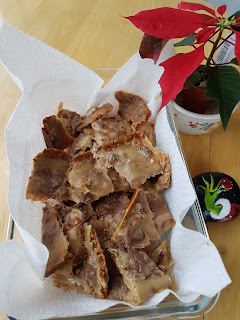 NOTE: The recipe called for Ganong Peanut Clusters, which I couldn’t find, so I substituted with OMG Graham Clusters with peanuts and toffee bits... easy to find. Line a rimmed cookie sheet with foil, butter the foil and place the graham crackers evenly on the sheet. In a medium sized heavy-bottomed pot, melt butter, add sugar, condensed milk and marshmallows and slowly melt, stirring continually. Pour the mixture evenly over the graham crackers and sprinkle chopped peanut clusters on top. Bake in a pre-heated 400 F oven for 5 – 6 minutes. With a fork spread cluster mix around then allow to cool 10 minutes. Refrigerate additional 30 min. Break candy into chunks and store in covered airtight container. Don't forget -- you can Enter to win a Cookie Gift Bag!! Seasons Greetings and Happy New Year!! Cookies baked by our friends!